That’s more like it, Betsoft Gaming. 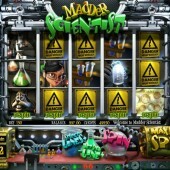 Having played – and been rather underwhelmed by – the developer’s original alchemy-based video slot, Mad Scientist, it’s nice to see that they’ve upped the voltage here. This slot features a delicious intro sequence, atmospheric music, voice overs from our crazy-haired bod and a new, glamorous assistant – all animated in full glory on the reels. However, as with the original Mad Scientist slot and most of Betsoft’s other 3D output, there are lots of interesting features to keep even the most jaded online slots fan happy. Played out over 5 reels and 30 paylines, and with coins starting at just $0.02, the most interesting feature you’ll notice straight away about the game is the ‘Re-spin’ feature. After each spin in the base game you’ll have the chance to re-spin any or all of the reels to try and hit those elusive bonus features. Finding yourself just one Scatter away from a bonus round? Re-spin that third reel and try and hit it. You’ll have to pay extra to re-spin, but if you work out what you could potentially win from hitting a winning combo and there’s certainly value there. The sequel is set some months after our original story, and our titular mad scientist has certainly got madder – a result of discovering a way of producing gold carrots in his lab. Therefore, on the reels, as well as the scientist and his beautiful lab assistant, we get microscopes, chemical jars, petri dishes full of bacteria, a Danger sign, and a rabbit who looks like he’s been caught well and truly in the headlights. There are some interesting bonus rounds. First up is a straightforward Click Me bonus, triggered by hitting three beaker Scatters on Reels 1, 3, and 5. Keep picking until you hit the Collect symbol. Hit three power lever icons anywhere on the reels, and you’ll trigger a free spins round with Wild Switches. One reel chosen at random will turn Wild for the duration of a set number of spins. The Great Experiment Round is Back! Finally, hit three or more carrot Scatters anywhere and you’ll trigger another mad scientist experiment round – help the scientist concoct a new potion to test on the carrot and win extra cash. 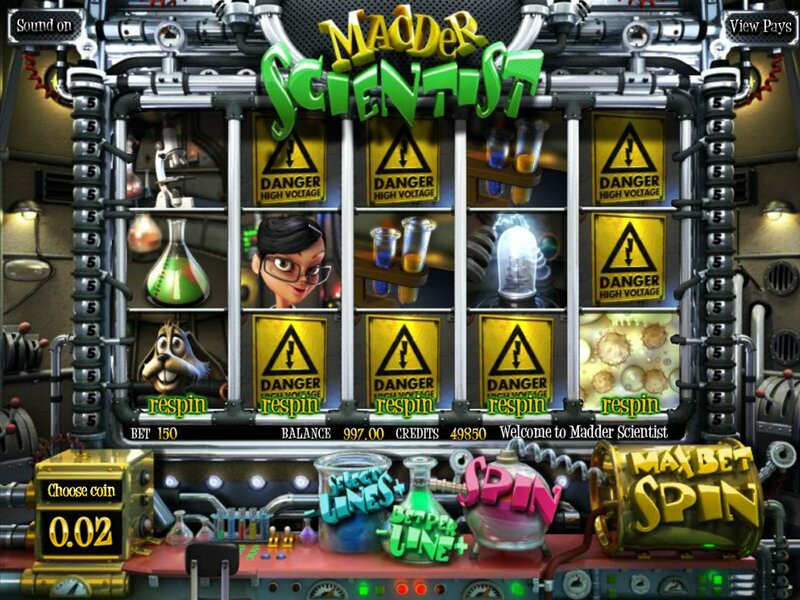 Madder Scientist is a great example of what Betsoft are all about – beautiful graphics, a great sense of humor, and some nice bonus touches. The Re-spin feature is the real draw here, and can really come into play if you’re close to hitting the bonus round. For example, I hit two bonus carrot Scatters on the reels and spent about 100 coins trying to hit that third Scatter to activate the bonus feature. I did manage it then proceeded to win 300 coins in the bonus feature itself. The game can be highly volatile (a bit like the various potions concocted by our mad genius friend) but it’s hard to beat for action. Betsoft’s original science-themed slot is worth a look if you enjoyed this, while any awesome alternative 3D Betsoft slot should entertain. Check out the prehistoric thrills of stone age-set 2 Million BC for some innovative bonus rounds.